Apple on 4th May 2018, announced iOS 12, macOS 10.14, watchOS 5 & tvOS 12 operating systems with new features and enhancement and promised to release its first beta to developers after the keynote presentation, and now as a developer, you can download the latest beta version of these operating systems on respective registered devices. To get these betas installed on respective devices, once must have an active Apple Developer account. You have to log in to your Apple Developer account and head over to download section to grab here, grab the new iOS 12 beta 1, macOS 10.14 beta 1, tvOS 12 beta 1 or watchOS 5 beta 1 profiles and install them on your devices. Thereafter upon restart of respective devices, you will be able to download these new betas over the air. iOS 12, macOS 10.14, and tvOS 12 Public betas will be available from 25th June 2018. In the event, Apple confirmed that it will release its first public beta version of iOS 12, macOS 10.14, and tvOS 12 operating systems later this month on June 25. So, if you are not a developer and want to test this beta version on your device, you will be able to install and test these betas on your devices on and from 25th June 2018 only. 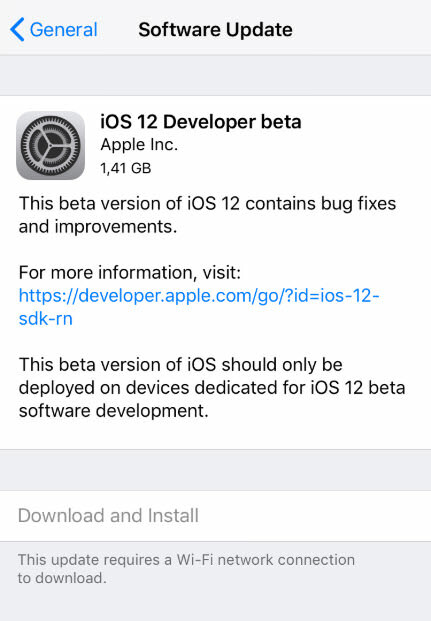 In between its first beta release to developers and public, Apple is expected to release at least one more developer beta of iOS 12, macOS 10.14, tvOS 12, and watchOS 5, that means public beta will have slightly improved performance and bug fixes as compared to Developer betas. The final release of these operating systems is expected to arrive later this year during September. Apple is currently working on iOS 11.4.1, macOS 10.13.6, tvOS 11.4.1, and watchOS 4.3.2 software updates. In the meanwhile, Apple is currently working on iOS 11.4, macOS 10.13.6, tvOS 11.4.1, and watchOS 4.3.2 updates and currently is in the development phase. Users running these beta versions will have to remove its beta profile from their respective devices to install the new iOS 12, macOS 10.14, tvOS 12, or watchOS 5 beta profiles. PrevPreviousNvidia Shield TV 2017: Read this before making decision.